We first encountered urine stone a long time ago, in the 90s. We have installed Merus rings in a sports home in Oberschwaben. This sports home was mainly frequented by men. And for the members, the cosy get-together and a cool beer were at least as important as the football itself. The host of the sports home has ordered the Merus Ring to reduce lime. In the tavern as well as in the showers of the athletes. The host was very satisfied with the result in the dishwasher or showers. After some time he contacted me and asked if it could be that the Merus ring also works against urine stone. All his 12 urinals his all by himself become clean again. Since then we have been listening from time to time to customers with similar experiences. The chemical formula of struvite is (NH4)Mg-6H2O. It is soluble in water and forms crystals when precipitating. Struvite can be a major problem in sewage treatment plants. At Con Edison in New York City we saw that struvite is regularly clogging the pipe at the end of the separation process of the solids and the liquid. 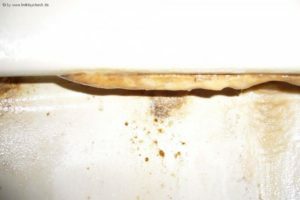 Some customers have to replace the entire pipe as the struvite deposits are too hard to remove in the short time given. Because of the constant flow of water to clear downtime is not possible. Merus rings manage to slow down or stop the new construction of Struvite. Not only in New York at Con Edison, but also in London at Thames Water and in Rennes (France), Merus Rings have been in successful use for years. Sometimes even pipes became clean again. However, this is strongly dependent on local conditions. While researching struvite and the urine stone we also learned that about 10% of the urine stones contain struvite. Now that you know how difficult it is to remove struvite from technical equipment, you can imagine how painful it must be to remove a kidney stone.